The Capitol Corridor passenger rail service is managed by the Capitol Corridor Joint Powers Authority (CCJPA) and provides a critical link between the Sacramento mega region and the San Francisco Bay Area. Since service began in 1991, ridership has grown to make the Capitol Corridor the third busiest passenger rail service in the United States. Expansion of service on the east end of the corridor between Roseville and Sacramento has been a part of the overall Business Plan since the late 90’s. In 2012, the CCJPA , in partnership with Union Pacific Railroad Company (UPRR), the cities of Roseville and Sacramento and Placer County Transportation Planning Agency (PCTPA) began working collaboratively to design and environmentally clear a third main track. The additional third track will allow Capitol Corridor to offer riders 10 round trips per day versus the one round trip currently offered. It will also preserve current Union Pacific Railroad freight operations and reliability for the benefit of goods movement through the region. On November 18, 2015 after extensive public engagement through the environmental analysis process, the CCJPA Board of Directors certified the state required Final Environmental Impact Report (EIR) and approved the project. As the more affordable communities to the east of San Francisco and Sacramento continue to grow and Downtown Sacramento revitalizes to become a premiere destination, the need for alternative travel options that move larger numbers of people while decreasing congestion on area freeways will increase dramatically. Capitol Corridor will provide direct access to new jobs, shopping, and entertainment in the Downtown Sacramento area through the redevelopment of the 244-acre rail yards and the construction of the Golden 1 Center (new Sacramento Kings Arena). 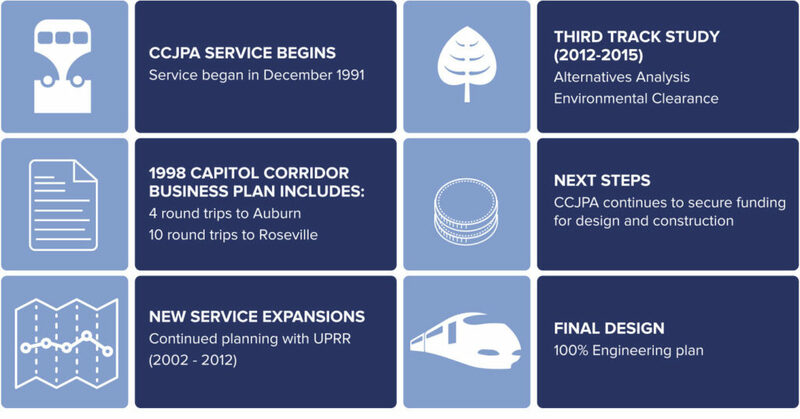 The Capitol Corridor rail service also provides an environmentally sustainable solution through reduction in vehicle miles traveled on freeways, use of renewable diesel, reduction of Greenhouse Gas Emissions, and other pollutants associated with single occupant vehicles. Overall, the intercity passenger rail service offers the rider a reliable, stress-free way to travel and enhances quality of life. The current estimated cost to construct the Third Track Project is $275 million, but it excludes Final Design, Mitigation and Right-of-Way costs. CCJPA will utilize a combination of different sources to fund the project including local and regional sources, cap-and-trade, Statewide Transportation Improvement Program (STIP) and California High-Speed Rail (feeder service funds) bonds. However, the funding strategy is still in progress and there is still a ways to go. To date, CCJPA has only been able to secure roughly $20 million from two state funding sources. The current estimated cost to construct the complete Third Track Project is $275 million. The Capitol Corridor has been awarded $87 million to date for this project, so a Phase I project has been identified to begin the work. This project will construct approximately 10 miles of third main track and a new layover/servicing facility for Capitol Corridor trains in Roseville. The completion of this Phase I project will allow the Capitol Corridor to operate three round trips (6 trains) daily between Sacramento and Roseville. At this time, final design is under way for this Phase I, with construction expected to follow. The Capitol Corridor expects to pursue the remainder of the project, for a total of 20 trains daily between Sacramento and Roseville, as soon as funding is available. For more project history, visit sactoroseville3rdtrack.com. Get on Board: We need your support! In order for the Third Track Project to become a reality, CCJPA needs the support of the communities it will connect and serve. Get on board and voice your support to your local and state representatives! The CCJPA has released its Request for Statement of Qualifications for the Final Engineering Design of Phase I of the Sacramento to Roseville Third Track Project. Download RFSOQ and related documents. Read Questions & Answers for Phase 1 Final Engineering Design RFSOQ. Third track project improvements are projected to reduce vehicle miles traveled by nearly 12 million throughout Northern California. Peak-hour Capitol Corridor trains can carry upwards of 600 people which can take 500 cars off the road during peak congestion periods. That’s about 25% congestion reduction in one lane of traffic.